If, due to tooth loss or trauma you have experienced a loss of bone, it may be necessary to build up this bone material in order to place a dental implant or other restorative device. At Dental365, we provide convenient, expert care that can restore your bone loss with extremely high success rates, as well as short recovery periods. Bone grafting is a common procedure. The additional bone material is often taken from the patient themselves, harvested from other areas of the mouth where drilling may have taken place and those bone fragments are suctioned from the mouth and used for the graft. In some cases, cadaver bones fragments are used. These fragments have been harvested by bone banks and are perfectly safe to use. 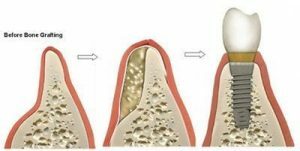 Why is bone grafting needed for dental implants or dentures? If you have ever lost a tooth and did not replace it, your jawbone may have deteriorated over time. 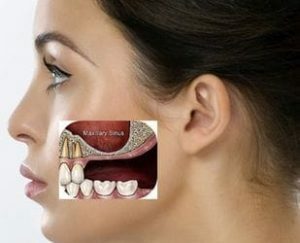 This loss of bone mass makes it difficult, and sometimes impossible, to get dental implants or dentures without first having corrective procedures to restore the bone loss. What kinds of bone grafting are used at Dental365? Using a process called ridge augmentation, the deteriorated bone structure can be restored. Ridge Augmentation is the process of lifting the gum and exposing the deficient bone area. Then, a bone-like substance is used in the area to improve the appearance of the mouth and to help improve chances for restorative services. With ridge augmentation, dental implants can be applied, last for years and will feel like your own natural teeth. Replacing your upper back teeth with dental implants may require your sinus floor to be repositioned in order to create enough space for the implants. During a simple procedure called sinus augmentation, various dental bone graft materials are used to encourage bone growth and eventually allow enough stability for the dental implant. In some cases, it may be possible to gently “push up” the bone under the sinus floor resulting in lifting the floor of the “dropped” sinus. And place bone replacement materials beneath the lifted bone. This bone material is replaced as your body introduces new bone into the area. At Dental365, our knowledgeable staff members are happy to discuss each dental bone graft surgery process with you and help you determine the best procedure for your needs. Our main goal is to help you restore your natural, healthy smile. Call us today at 844.365.DENTAL or request an appointment through our website at any time.